IVLA Student Spotlight – Meet Gabby! Home/News/IVLA Student Spotlight – Meet Gabby! When did you first start riding horses? I found my passion for horses when I was about two years old. I did not start riding until I was about five years old. What kind of horseback riding do you do? In which events do you compete? 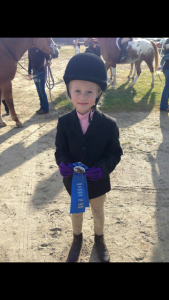 I compete in the large pony hunters at WEF (Winter Equestrian Festival), Fox Lea Farm, and Zones. 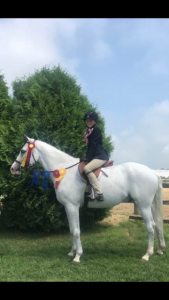 I have received the Pleasure Pony Award, Grand Champion, Champion, and Reserve Champion. What do you like best about horseback riding? I like everything about horseback riding but what I like most is being able to ride with all my friends. 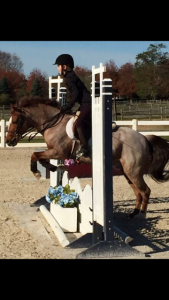 We chose IVLA because we like to travel a lot to horse shows, tennis tournaments for my brothers, or just to explore! This curriculum makes it easy for us to do all of these things! 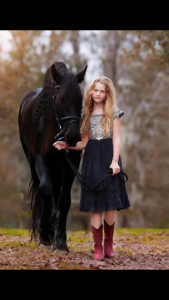 How does IVLA fit in with your horseback riding? It helps because I can work anywhere anytime. It makes it easy to go to horse shows because I don’t have to worry about getting behind. Thanks for sharing, Gabby C.!